A person may be able to nibble around the edges of canonical law in order to say that this or that arcane point should be “applied by the Spirit” and not taken literally by a “legalistic” mind. However, there must be many major elements in the law that are so required to preserve the christian life in the church as to be immune to such abstraction. If there is a visible Church, as the Orthodox believe, then it must be led by a hierarchy of men that lawfully rule the Church according to its canons. In that case the canonical principles of how to deal with heresy among the clergy would stand as central in the defense of the Faith. Excerpted below are a few of the canons that bear on the hierarchy, given here with the purpose of demonstrating the principles of its governance. One can readily see that in addition to the instruction found in the scripture, rules such as these would be necessary in order to regulate the activities in the Church. If any one of the clergy or laity who is excommunicated, or not to be received, shall go away, and be received in another city without commendatory letters, let both the receiver and the received be excommunicated. But if he be excommunicated already, let the time of his excommunication be lengthened. If, however, the bishop, with whom any such persons are staying, shall disregard the command that they are to cease … let him be excommunicated … . Canon XVII.If a clergyman becomes surety for any one, let him be deposed. Canon (XXI, XXII, XXIII, XXIV). If any bishop, presbyter, or deacon, having been justly deposed upon open accusations, shall dare to meddle with any of the divine offices which had been intrusted to him, (or) if any bishop, presbyter, or deacon, shall obtain possession of that dignity by money, let both him and the person who ordained him be deposed, and also altogether cut off from all communion … let him be altogether cut off from the Church. If any bishop obtain possession of a church by the aid of the temporal powers, let him be deposed and excommunicated, and all who communicate with him. If any presbyter, despising his own bishop, shall collect a separate congregation, and erect another altar, not having any grounds for condemning the bishop with regard to religion or justice, let him be deposed for his ambition; for he is a tyrant; in like manner also the rest of the clergy, and as many as join him; and let laymen be excommunicated. Let this, however, be done after a first, second, and third admonition from the bishop. If any presbyter or deacon has been excommunicated by a bishop, he may not be received into communion again by any other than by him who excommunicated him, unless it happen that the bishop who excommunicated him be dead. No foreign bishop, presbyter, or deacon, may be received without commendatory letters; and (examination). (If these fail), although you supply them with what they need, you must not receive them into communion, for many things are done surreptitiously. Let not a bishop dare to ordain beyond his own limits, in cities and places not subject to him (or) let him be deposed, and those also whom he has ordained. If a bishop or presbyter, or deacon, is addicted to dice or drinking, let him either give it over, or … takes usury from those who borrow of him, give up doing so, or be deposed. Let a bishop, presbyter, or deacon, who has … prayed with heretics, be excommunicated: but if he has (also) permitted them to perform any clerical office, … (or) has admitted the baptism or sacrifice of heretics, … let him be deposed. If any bishop or presbyter, contrary to the ordinance of the Lord, does not baptize into the Father, the Son, and the Holy Ghost, but into three Unoriginated Beings, or three Sons, or three Comforters, let him be deposed. Canon 6. Concerning the necessity of not permitting heretics to come into the house of God, so long as they persist in their heresy. When we had assembled, according to the religious decree [of the Emperors], in the Metropolis of Ephesus, certain persons, a little more than thirty in number, withdrew from amongst us (members of the clergy that had given up their priestly authority); since some of them had already been deposed; and since from their refusing to join in our decree against Nestorius … ; the Holy Synod, by one common decree, deposed them from all ecclesiastical communion, and deprived them of all their priestly power by which they might injure or profit any persons. IF any have been condemned for evil practices by the holy Synod, or by their own bishops; and if (the apostates) attempted, or shall hereafter attempt, uncanonically to restore such persons to communion and to their former rank, we have declared that they shall not be profited thereby, but shall remain deposed nevertheless. 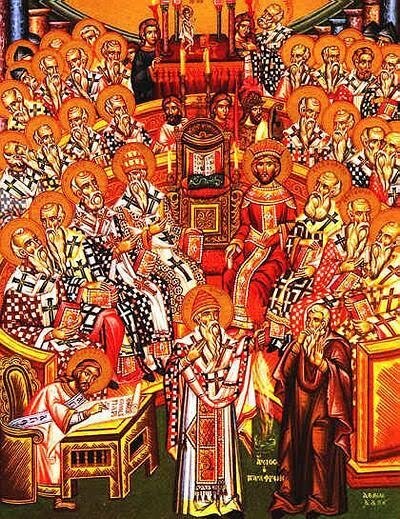 WHEN these things had been read, the holy Synod decreed that it is unlawful for any man to bring forward, or to write, or to compose a different (eteran) Faith as a rival to that established by the holy Fathers assembled with the Holy Ghost in Nicaea. Visit The Canons of the Eastern Orthodox Church website. An excellent resource!